JPBI (Jurnal Pendidikan Biologi Indonesia), ISSN 2442-3750 (print); ISSN 2527-6204 (online), publishes a scientific papers on the results of the study/research and review of the literature in the sphere of biology education in primary education, secondary education, and higher education. Additionally, this journal also covers the issues on environmental education. This journal collaborates with Asosiasi Lesson Study Indonesia (ALSI)/Indonesian Association of Lesson Study. Editor accepts the article has not been published in other media with the writing format as listed on page manuscript writing guidelines. 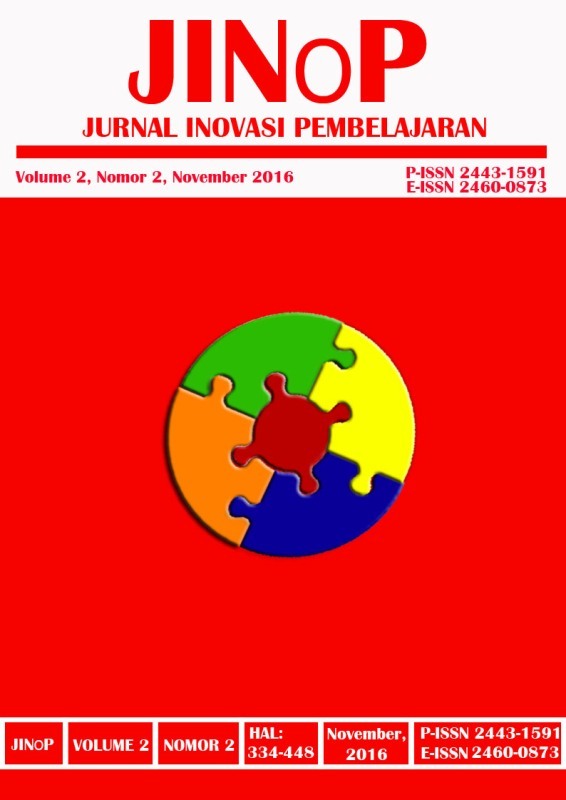 JPBI (Jurnal Pendidikan Biologi Indonesia) was established in 2015, published three times a year, on March, July, and November. Started by Volume 3, Number 3, November 2017, the journal was only published by using one language namely English. The journal has been indexed in DOAJ, BASE, Garuda, Google Scholar, SINTA, and others. Jurnal Teknik Industri has been accredited by National Journal Accreditation (ARJUNA) Managed by Ministry of Research, Technology, and Higher Education, Republic Indonesia with Second Grade (Peringkat 2, Sinta 2) since year 2018 according to the decree No. 34/E/KPT/2018. 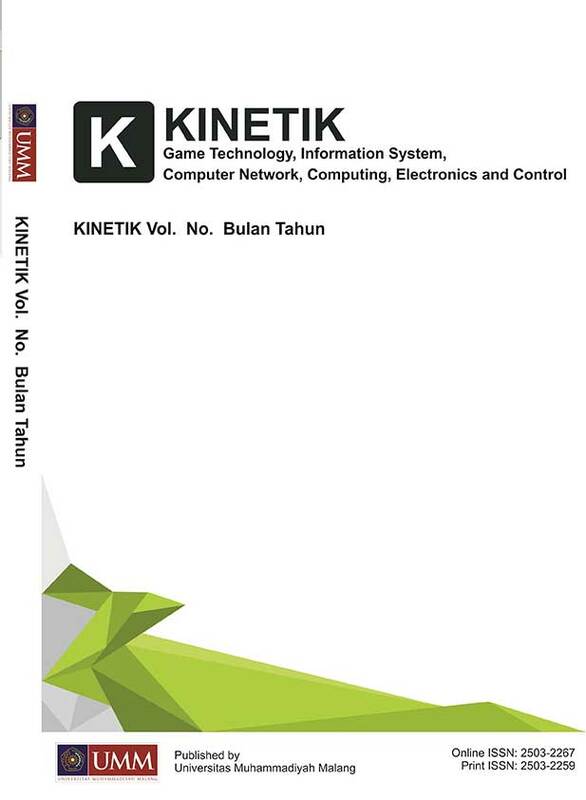 The Jurnal Teknik Industri is a peer-reviewed journal is published twice a year (February and August). The Jurnal Teknik Industri aims to provide a forum exchange and an interface between researchers and practitioners in any industrial engineering related field. This journal only accepts articles from original research results (top priority), case study articles (not priorities), and scientific review articles that are new (not preference). Scopes this journal are Logistics and Supply Chain Management, Product Design dan Eco Product, Production System, Productivity Industrial System, Quality Management, Quality Engineering, Lean Manufacturing, Ergonomics, Human Factors Engineering, Performance Measurement Systems, Decision Analysis, Strategic Management, Project management, Reliability, human resource management, and Marketing Management. This journal is published by the Department of Industrial Engineering, Faculty Engineering, University of Muhammadiyah Malang. 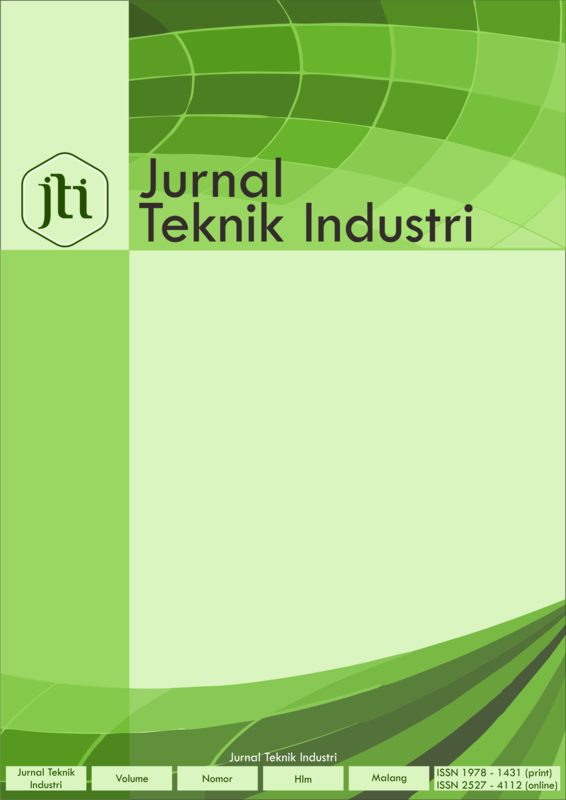 The Jurnal Teknik Industri is an Industrial Engineering Journal first published on February 2000. Jurnal Teknik Industri name was changed twice as follows;(1) Optimum (2000) ISSN 1412-7148 (print); (2) Jurnal Teknik Industri (Februari 2007). In August 2016 (Vol 17, No 2 August 2016), Jurnal Teknik Industri has got online ISSN. For details visit the journal history. Grade Peringkat 3 (SINTA 3) the decree No. KEMBARA: Jurnal Keilmuan Bahasa, Sastra, dan Pengajarannya (P-ISSN 2442-7632 | E-ISSN 2442-9287), managed by the Department of Education of Language and Literature of Indonesia, Faculty of Teacher Training and Education, University of Muhammadiyah Malang in cooperation with the Asosiasi Dosen Bahasa dan Sastra Indonesia (ADOBSI) /Association of Lecturers of Languages and Indonesian Literature and Ikatan Program Studi Pendidikan Bahasa dan Sastra Indonesia (IKAPROBSI)/the Association of Indonesian Language and Literature Studies Program. 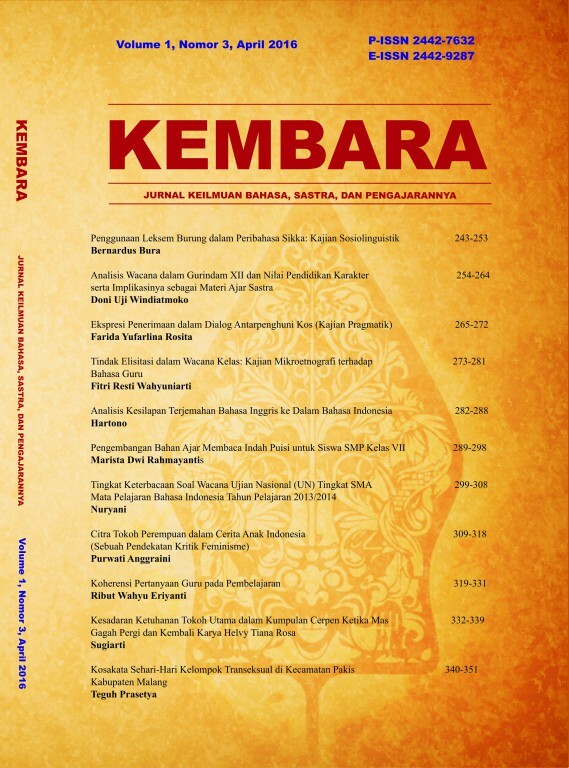 KEMBARA: Jurnal Keilmuan Bahasa, Sastra, dan Pengajarannya is established in 2015, published twice a year in April and October. KEMBARA: Jurnal Keilmuan Bahasa, Sastra, dan Pengajarannya publishes articles of research in the scope of language, literature, and teaching. All articles will be reviewed by experts before they are accepted for publication. The editor receives articles that have not been published in other media with the writing format as listed on the scriptwriting guide page. 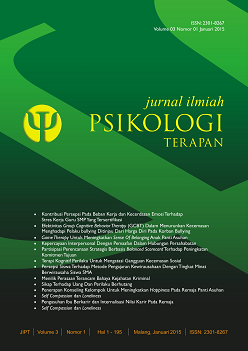 JIPT (Jurnal Ilmiah Psikologi Terapan) publishes a scientific papers on the results of the study/research and review of the literature in the sphere of psychology. Additionally, this journal also covers the issues on aplied psychology. 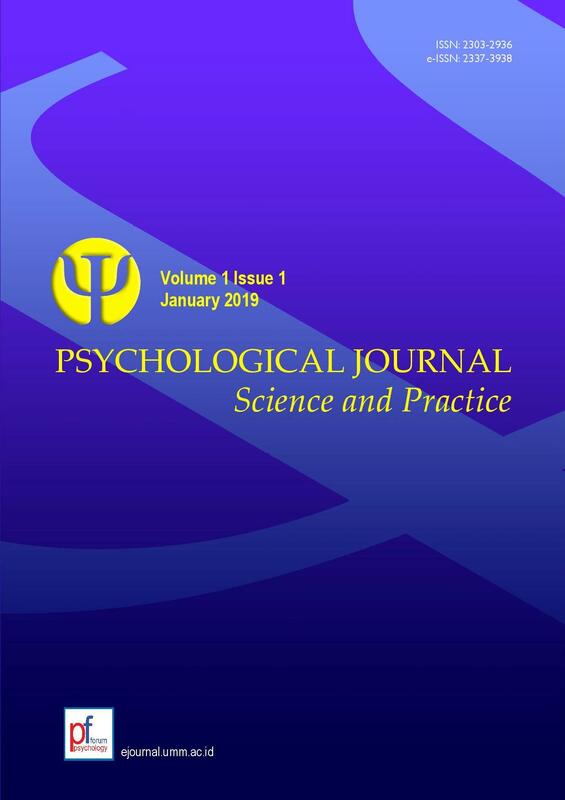 Editors welcome scholars, researchers, and practitioners of psychology around the world to submit scholarly articles to be published through this journal. All articles will be reviewed by experts before accepted for publication. Each author is solely responsible for the content of published articles. Editors accept the article has not been published in other media with the writing format as listed on page manuscript writing guidelines. The journal has been indexed in Google Scholar, DOI Crossref, SINTA 3, and others. JIPT (Jurnal Ilmiah Psikologi Terapan) was established in 2013, published two times a year, on January and August. JINoP (Jurnal Inovasi Pembelajaran) FTTE University of Muhammadiyah Malang, ISSN 2443-1591 (Print); ISSN 2460-0873 (Online). Published twice a year in May and November by University of Muhammadiyah Malang in one volume last two numbers. Scientific literature contains research on learning innovations ranging from basic education through college. The journal has been indexed in DOAJ, Google Scholar, DOI Crossref, SINTA 3 (ACCREDITED), and others. Jurnal Keperawatan is a peer-reviewed journal published by School of Nursing at the Faculty of Health Science, University of Muhammadiyah Malang (UMM) and affiliate with the Indonesia National Nurse Association (INNA) of Malang, which is focusing on several issues in nursing field. The first volume was published on 2010, and it is published twice a year, issued on January and July. The Jurnal Keperawatan aims to provide a forum exchange and an interface between researchers and practitioners in any nursing related field. This journal only accepts articles from original research results (top priority), case study articles (not priorities), and scientific review articles that are new (not preference). 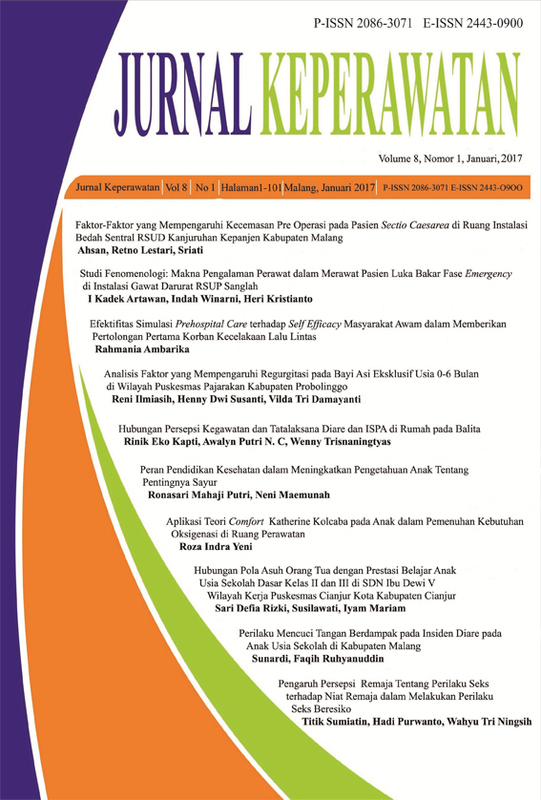 Jurnal Keperawatan is a scientific publication for widespread research and criticism topics in nursing studies, but are not limited in the following issues: paediatric nursing, women and children health in nursing, community health nursing, psychiatric nursing, medical surgical nursing, emergency and disaster nursing, and nursing education. 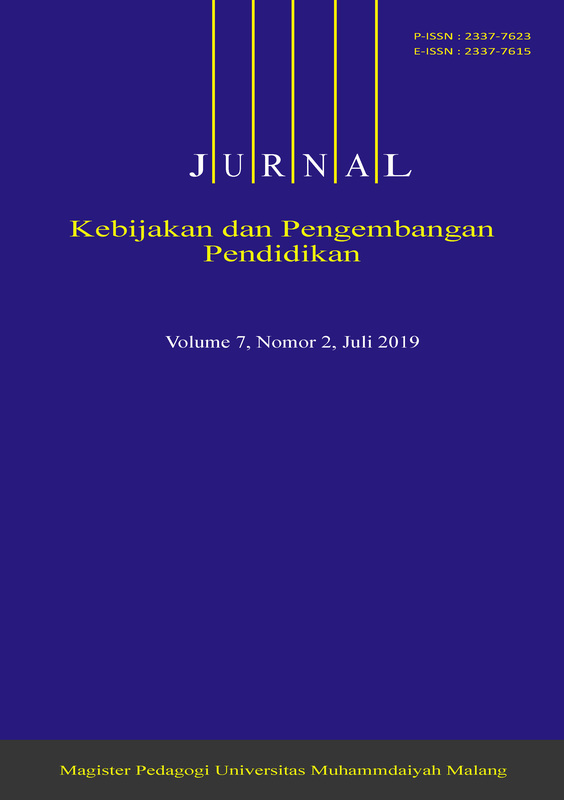 Jurnal Reviu Akuntansi dan Keuangan (JRAK) is peer reviewed journal published by Universitas Muhammadiyah Malang in collaboration with the Association of Accounting Department of Muhammadiyah Higher Education (APSA PTM). ISSN: 2615-2223 (Online) and 2088-0685 (Print). JRAK is accredited grade 2 by Ministry of Research, Technology and Higher Education of Republic of Indonesia Decree (SK) No. 10/E/KPT/2019. Since the first issued in January 2011, JRAK is publishing scientific articles consistently. JRAK publishes the new editions every April and October. By January 2016, JRAK has published both printed (book) and electronic (PDF) versions. 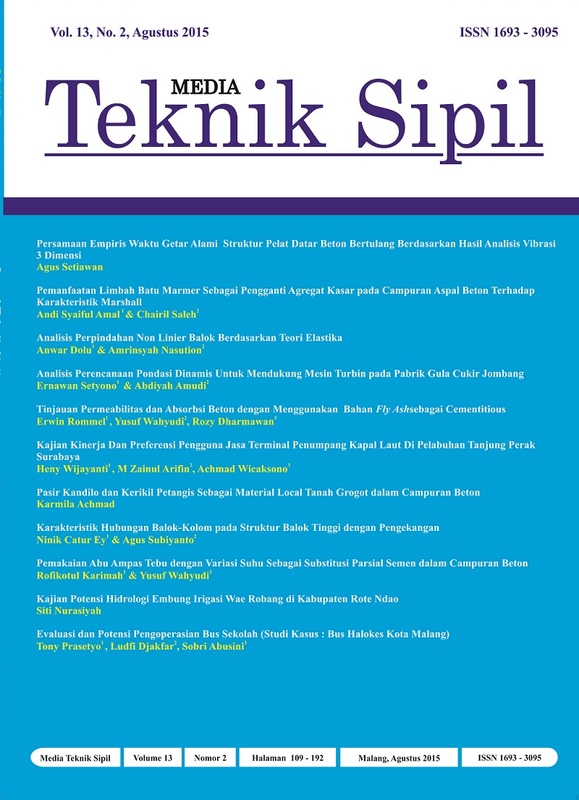 Media Teknik Sipil Journal [ISSN: 1693-3095 (print) ; e-ISSN: 2597-7660 (online)] is published by the Department of Civil Engineering Faculty of Engineering University of Muhammadiyah Malang. Media Teknik Sipil Journal is a venue for practitioners, researchers, academics, observers to publish the results of scientific research in the field of civil engineering covering the structure, construction management, water management, transportation, geotechnical and environmental. Publication schedule February and August. Media Teknik Sipil indexed by Google Scholar and GARUDA. The Social and Political Research Center (PKSP), Faculty of Social and Political Sciences, Universitas Muhammadiyah Malang proudly presents Journal Sospol (Sospol: Jurnal Sosial Politik). Journal Sospol cordially invites researchers, academicians, and experts to submit research on sociology, communications, international relations, governance, and social welfare sciences. The Journal Sospol supports topics of publication covering domestic and international issues dealing with social politics field of research. The Journal Sospol aims to explore knowledge and contribute on policy recommendation due to response state and society problems through intellectual perspectives. 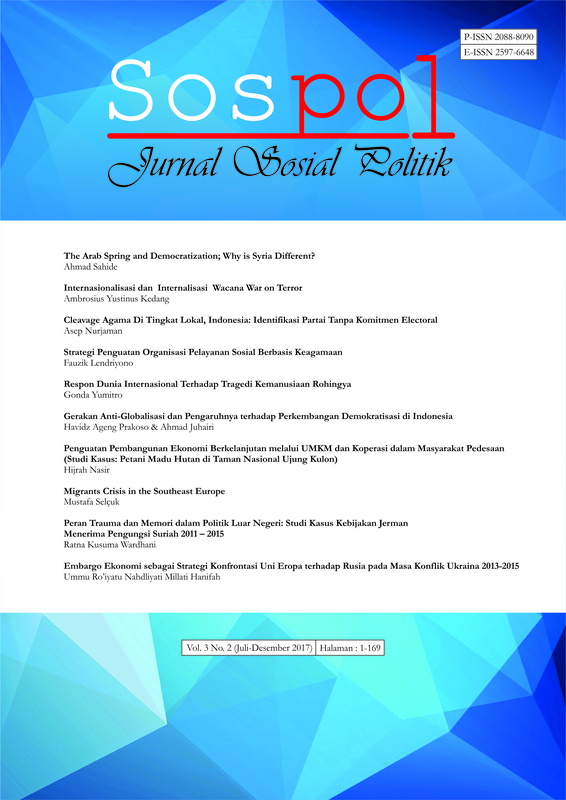 On the first publication, we used title “Sospol: Jurnal Ilmu Sosial dan Ilmu Politik”. It published 2 (two) issues in a year. Volume 1 published on March 2011 and September 2011. It written in Bahasa Indonesia by printed version ISSN 2088-8090. Due to technical problems, unfortunately, the Volume 2 of Journal Sospol published in November 2016 with single issue. It was the beginning of Journal Sospol accepted articles written in English as foreign languange. The publisher – PKSP released its online version in cooperation with Research and Community Services Directorate (DPPM) of Universitas Muhammadiyah Malang. In 2017, Journal Sospol released its new cover and template. Journal Sospol stands for Journal of Social Politics. It has new structural organization of management and published twice a year during January-June for Issue 1 and July-December for Issue 2. Vol 3 No 2 (2017) officially published online by e-ISSN 2597-6648. We got national accredited (SINTA 4) in 2018 starts from publication Vol 2 No 1 (2016). Journal Sospol is indexed by Google scholars and ISJD LIPI. We hope to be one of acknowledge world academics reference and stands for support research sustainibility of scholars from within and outside the country. Journal of Energy, Mechanical, Material, and Manufacturing Engineering (JEMMME) is registered with ISSN 2548-4281 (online) and 2541-6332(print) on LIPI (Lembaga Ilmu Pengetahuan Indonesia) also known as The Indonesian Institute of Sciences. This journal is under publishment of Department of Mechanical Engineering Universitas Muhammadiyah Malang. It is a scientific journal focusing on Energy, Mechanical, Material, and Manufacturing. It provides a publishing platform for scientists and academicians to share, to publish and discuss all aspects of the latest outstanding development in the field of Mechanical Engineering. 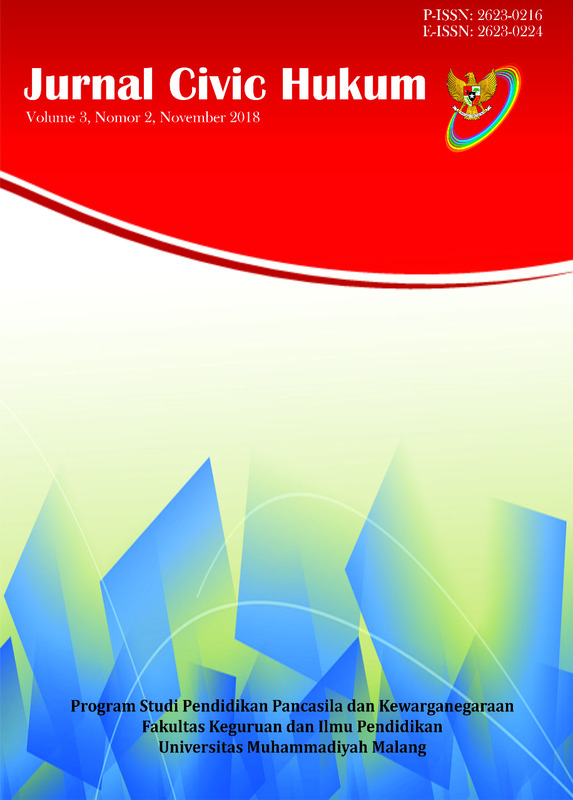 The first issue of this journal was in late 2016. It presents seven articles in an issue. Published twice a year in May and November, this journal conducts double-blind peer-review process for each manuscript. Evaluation of the manuscript is by anonymous referees. For obtaining qualified articles, the future authors are required to submit the original, relevance research results in the form of article, and it is written in English. 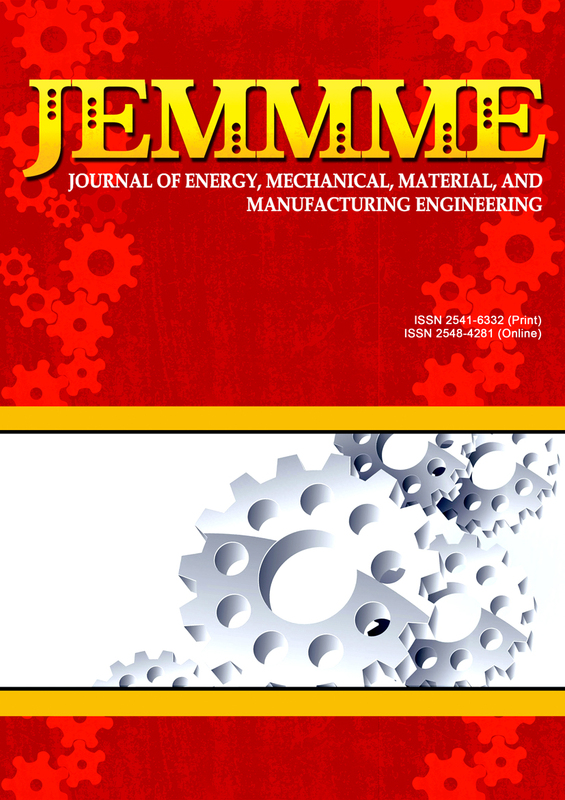 For indexation, JEMMME (Journal of Energy Mechanical, Material, and Manufacturing Engineering) can be browsed online on Google Scholar, BASE, Onesearch, Garuda, and others. On December 5th, 2018, this journal had been indexed by DOAJ indexing. 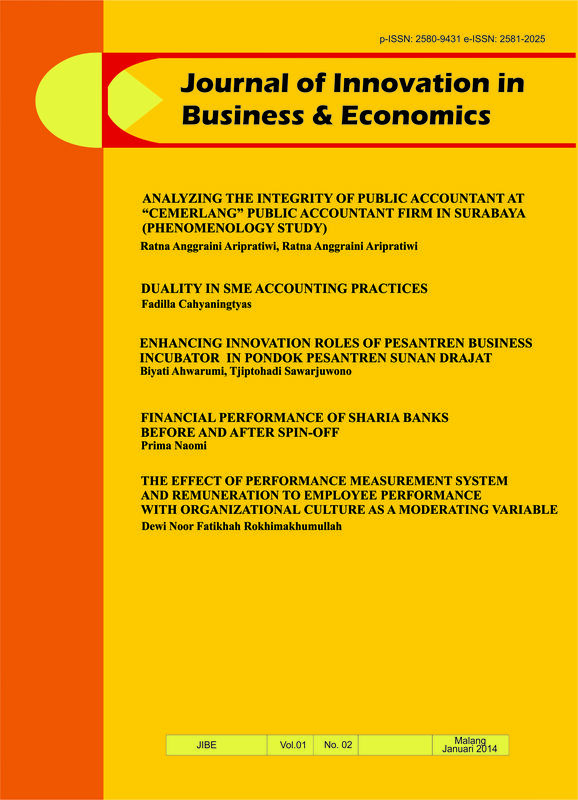 The Journal of Innovation in Business and Economics (JIBE) is published by the Department of Economics and Business at University of Muhammadiyah Malang in 2017. Previously this journal was known as Jurnal Media Ekonomi that was initially published in 2000. 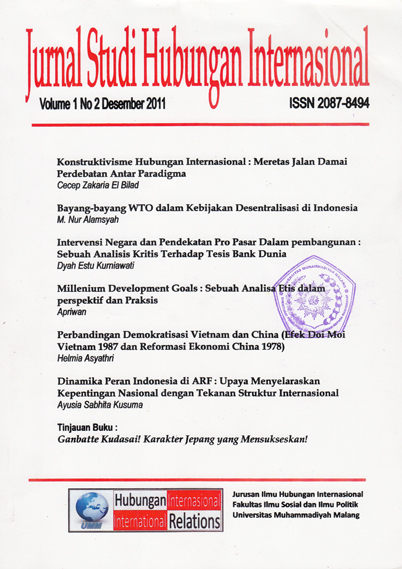 In 2011 until 2016, this journal was renamed as Ekonomika Bisnis: Jurnal Penelitian dan Pemikiran. JIBE is a generalist; academic review covering all fields of business, management, accounting, and economics. The journal seeks to examine the emerging and state of the art future innovations in business, economics and management made possible by advances in information, communication, and technologies. We welcome contributions covering all fields of business innovations including, but not limited to information, communication and technologies applications in business, cost and revenue model, business ethics, business strategy, applications of innovation in business and management, entrepreneurship & innovation, information systems, international business & cross-cultural studies, marketing, organization studies, general management as well as micro and macro economics. 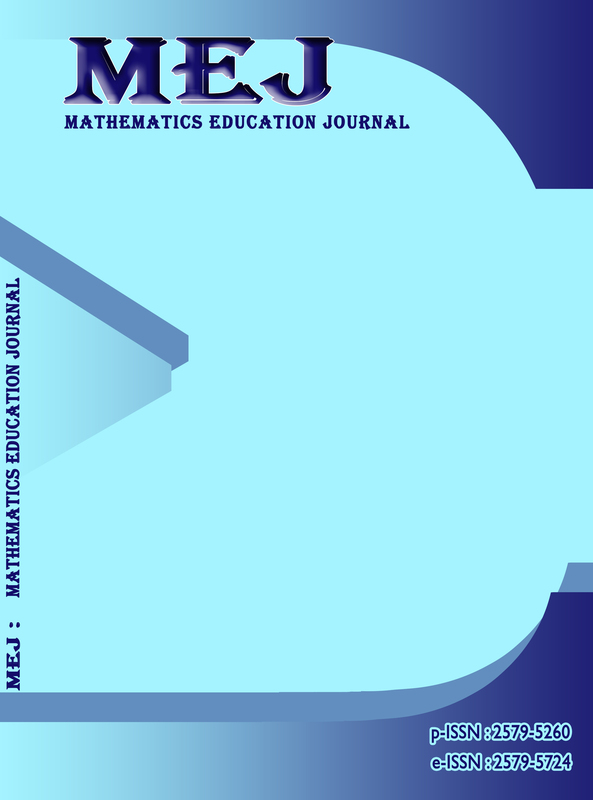 MEJ (Mathematics Education Journal) is a journal of mathematics education that contains articles about methods or methods and analysis of learning in the field of mathematics. This journal is a change from the journal of mathematics education that began publishing in 2010. 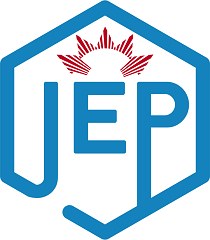 Journal of mathematics education published only until 2013 and began to publish again in 2016 with hard copy and began in 2017 this journal changed its name to MEJ (Mathematics Education Journal) and became Online Journal System. JP2SD (Jurnal Pemikiran dan Pengembangan Sekolah Dasar) is a journal of Elementary School Teacher Education Department, Faculty of Teacher Training and Education, University of Muhammadiyah Malang. The scope of its journal is an elementary school, education, innovation of learning, learning methods and media, learning innovation, and learning management. This journal will be published twice in a year in April and September. Journal JP2SD is an elementary school thinking and development Journal first published in April 2013. Start For 2017, The Journal JP2SD used OJS for journal managing (previously, We used email). For increasing accessibility and protection from plagiarism, Journal JP2SD has registered all the publications to CrossRef to get digital Object Identifier (DOI). Start For 2017, readers have to use DOI that stated in the document and website. Jurnal ekonomi pembangunan published by Pusat Pengkajian Ekonomi dan Kebijakan Publik (PPEKP), Faculty of Economics and Business, University of Muhammadiyah Malang. This journal is used as a source of information about scientific works in the field of development economics for every academician, researcher, lecturer and activist and other authors. 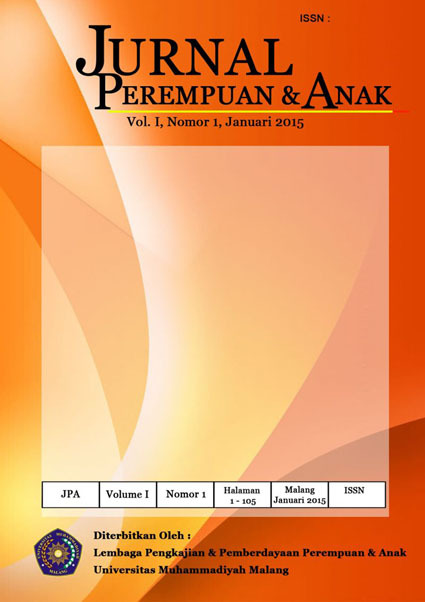 The Jurnal Ekonomi Pembangunan is a peer-reviewed journal is published twice a year (June and December). This journal has been accredited by National Journal Accreditation (ARJUNA) Managed by Ministry of Research, Technology, and Higher Education, Republic Indonesia with Four Grade (Peringkat 4, Sinta 4) since year 2018 according to the decree No. 34/E/KPT/2018. FALAH: Jurnal Ekonomi Syariah (ISSN.2502-7824; e-ISSN. ISSN: 2502-3918) is a tool for scientific publications, to disseminate research and important issues in relation to Islamic economics. 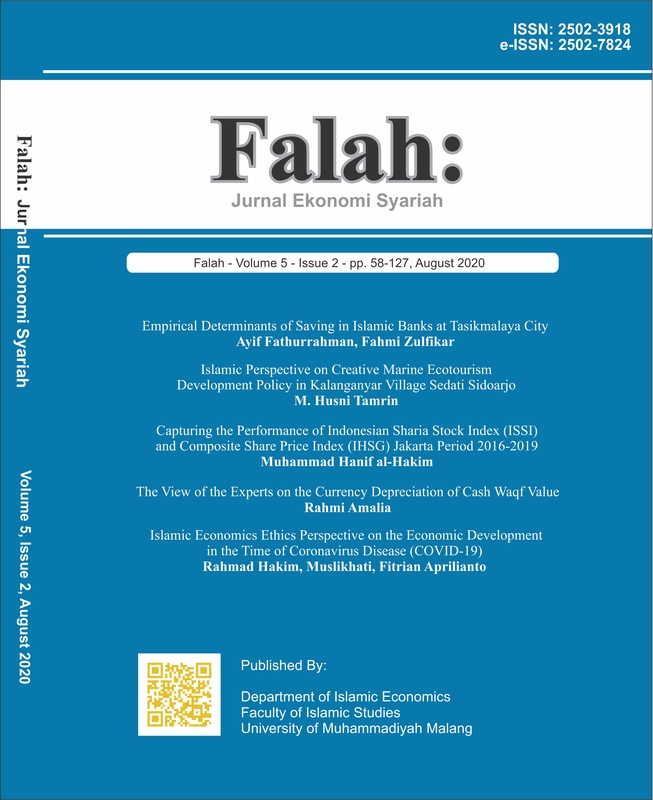 Since February 2016, this Jurnal published twice 2 (two) times a year in February and August by the Islamic Economics Program, University of Muhammadiyah Malang. This journal has been indexed in Garuda (Garda Rujukan Digital), One Search, Google Scholar, Crossref and Moraref. Editor –in-chief : Dr. Widayat., MM. Manajemen Bisnis (JMB) is published by the Department of Management, Faculty of Economic and Business, University of Muhammadiyah Malang in 2011. In December 2018, JMB has got online ISSN for articles that publish started from Volume 9 No. 1, April 2019. JMB is a peer reviewed and open acces journal which published twice a year (April and October). 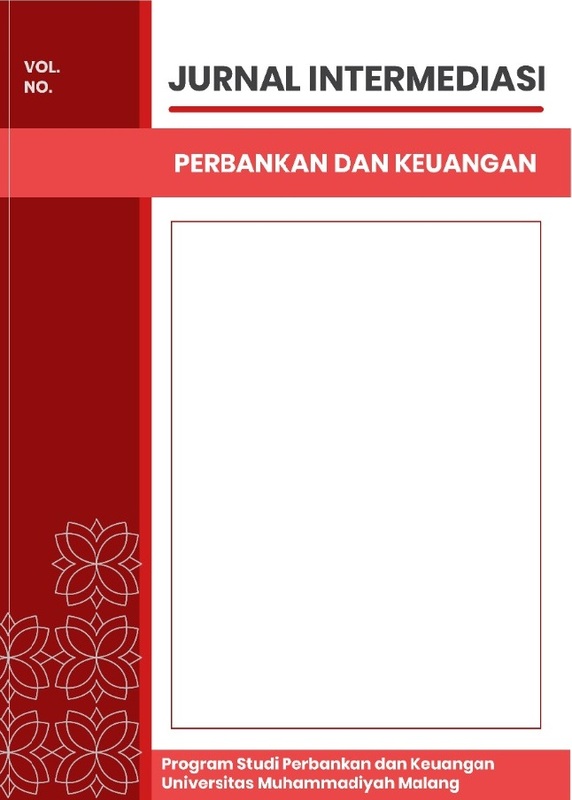 This journal published articles in indonesian but in 2019 JMB will publish all articles fully in english. This journal only accepts articles from original research results. JMB welcome all articles related to management and business fields. Subjects suitable for publication include but are not limited to the following fields: finance management, operation management, human resource management, marketing management, strategic management, management information system, knowledge management, entrepreneurship, business management, business innovation, international business, and business ethics. Manajemen Bisnis has been indexed in Google Schoolar. JMB keep attempt to be indexed in others journal directories. Jurnal Saintika Medika has been accredited by National Journal Accreditation (ARJUNA) Managed by Ministry of Research, Technology, and Higher Education, Republic Indonesia Number No. 3/E/KPT/2019 as a SINTA 4 journal. Jurnal Civic Hukum, P-ISSN 2623-0216 (print), E-ISSN 2623-0224 (online), is published by Civic Education Department, Faculty of Teacher Training and Education, University of Muhammadiyah Malang. Jurnal Civic Hukum is Journal the results of the research and study the libraries focus attention on citizenship issues, Character Education, Law, Politics, Anti-corruption Education, and Learning Citizenship. The editors welcome the scholars, researchers, and practitioners Education to send scientific articles for published through Jurnal Civic Hukum. All Article will be reviewed by the expert before accepted for publishing. Each author charge responsibility against content Article. Jurnal Civic Hukum published two times a year, in May and November. Jurnal Ilmu Ekonomi (JIE) published by the Department of Economics Development, Faculty of Economics and Business, University of Muhammadiyah Malang. This journal is used as a source of information about scientific works in the field of economics for every academician, especially lecturers, students and alumni of the University of Muhammadiyah Malang and other authors. 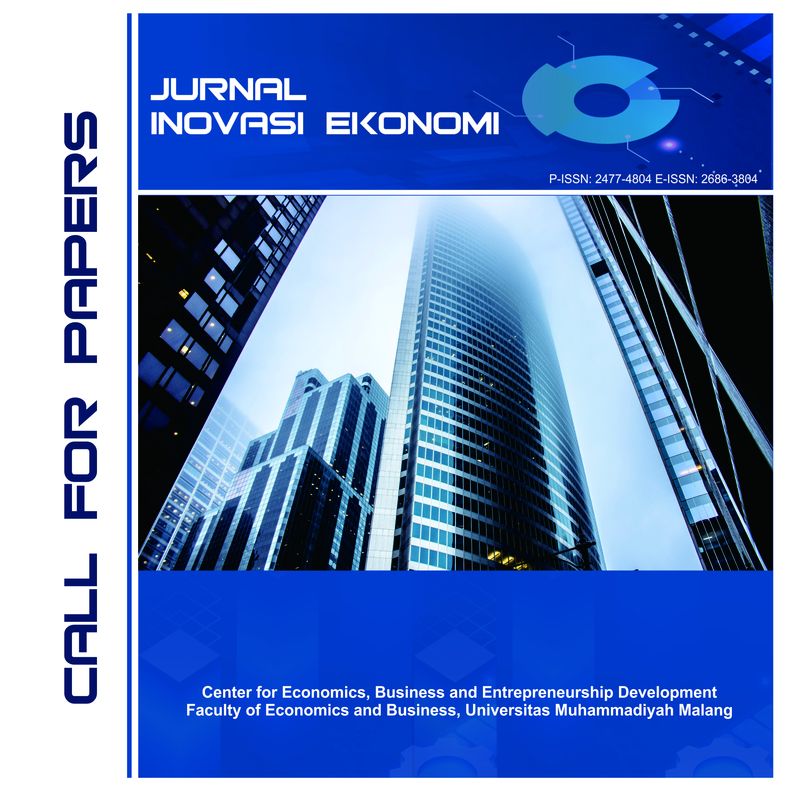 Jurnal Studi Kasus Inovasi Ekonomi (SKIE) is a journal managed by the Center for Economic, Business and Entrepreneurship Development (PPEBK), Faculty of Economics and Business, University of Muhammadiyah Malang. SKIE focuses on a number of major themes, including: 1) community economic empowerment; 2) development and empowerment of the creative economy; 3) digital-based economic development; 4) development and empowerment of small, micro and medium enterprises (SMEs); and 5) economic empowerment at rural communities. Jurnal Studi Kasus Inovasi Ekonomi (SKIE) adalah jurnal yang dikelola oleh Pusat Pengembangan Ekonomi, Bisnis dan Kewirausahaan (PPEBK) Fakultas Ekonomi dan Bisnis, Universitas Muhammadiyah Malang. SKIE memfokuskan pada beberapa tema besar antara lain: 1) pemberdayaan ekonomi masyarakat; 2) pengembangan dan permberdayaan ekonomi kreatif; 3) pengembangan ekonomi berbasis digital; 4) pengembangan dan pemberdayaan usaha kecil, mikro dan menengah (UKM); dan 5) pemberdayaan ekonomi masyarakat pedesaan. 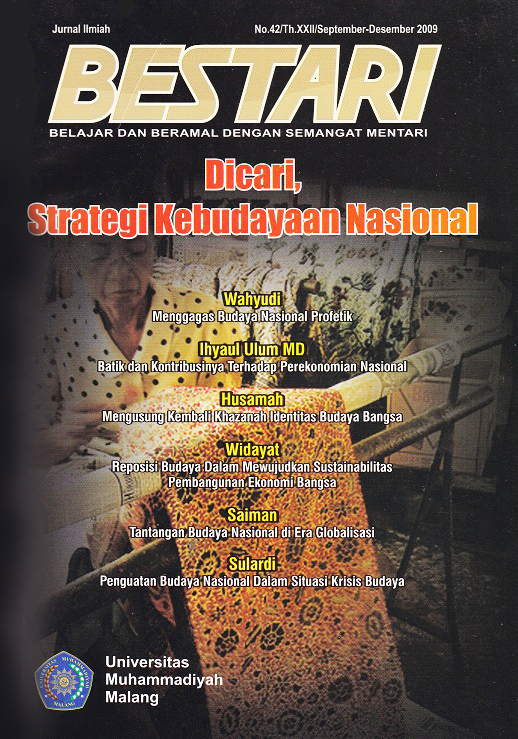 Satwika (Kajian Budaya dan Perubahan Sosial), ISSN 2580-8567 (print) and 2580-4431 (online) is published by Cultural Institute, University of Muhammadiyah Malang. 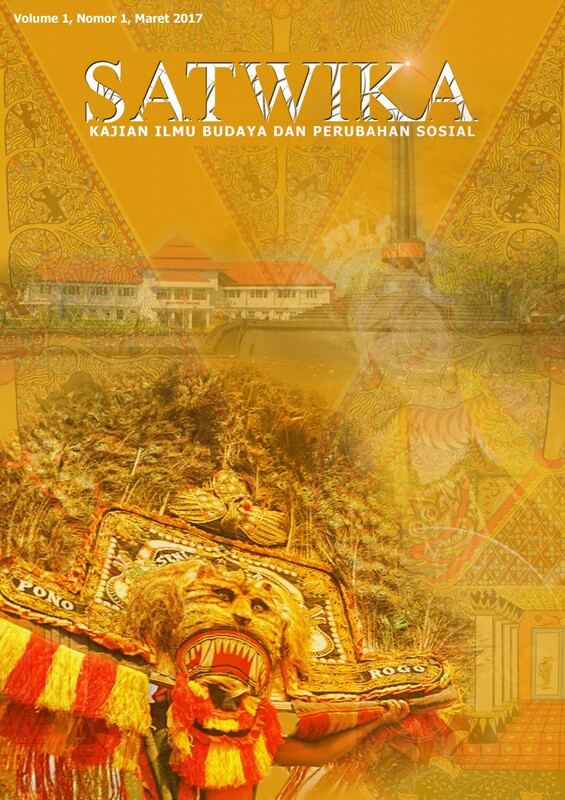 Satwika (Kajian Budaya dan Perubahan Sosial) publishes scientific papers on the results of studies/research and reviews of the literature in the fields of cultural studies and social change. The journal is oriented towards research on cultural phenomena and the current social changes. With the aim of dialogue in contemporary socio-cultural conditions, journals encourage cultural analysis and social change that challenge ideological modes and share inequitable justice, contribute to broad theoretical debates, and help stimulate new and progressive social involvement. This journal welcomes research related to culture and meaning, focuses on key questions about human existence and various problems facing society today. Editors accept the article (written in English) has not been published in other media with the writing format as listed on page manuscript writing guidelines. The journal has been indexed in Google Scholar. The journal was established in 2017, published two times a year, on April and October. CELTIC is published twice a year, in June and December. This journal welcomes articles in the form of research reports or library research on Literature (English), Linguistics (English, Indonesian), Culture (English, Indonesia) and Teaching (English, Indonesian). Celtic firstly published in June 2014. 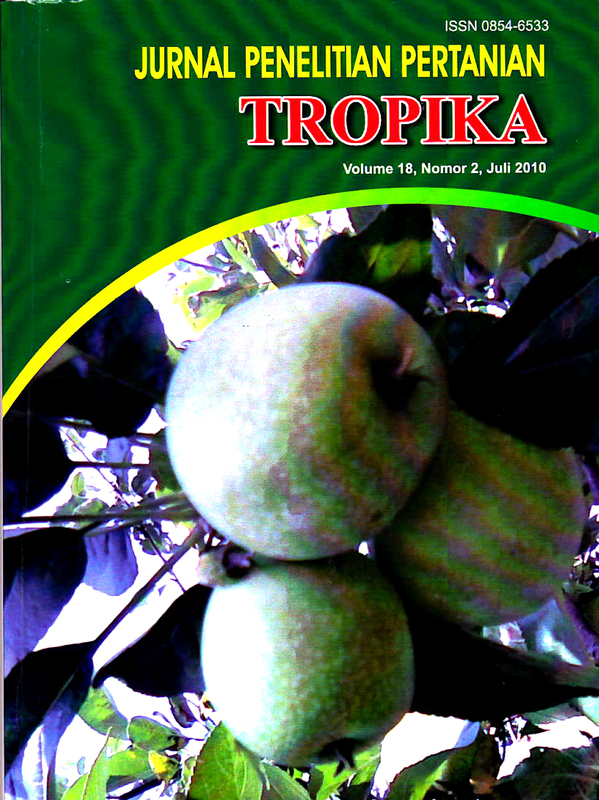 Starting from volume 1, no 1 at June 2014. However, Celtic was once absent for 2 years (2016-2017); Volume 3 No 2, Volume 4 No 1 & 2. and Volume 5 No 1. In December 2018 (Vol 5, No 2 December 2018), Celtic has got online ISSN. 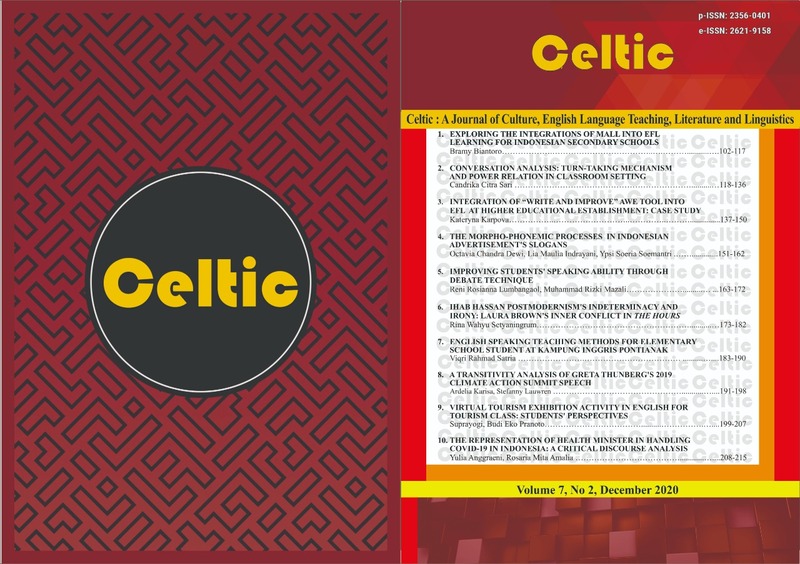 Starting from December 2018 (Vol 5 no 2 2018 edition, Celtic has added new layout style (template). The new style is used to simplify the writing of mathematical models. Start For 2018, Celtic used full OJS for journal managing (previously, we used email). 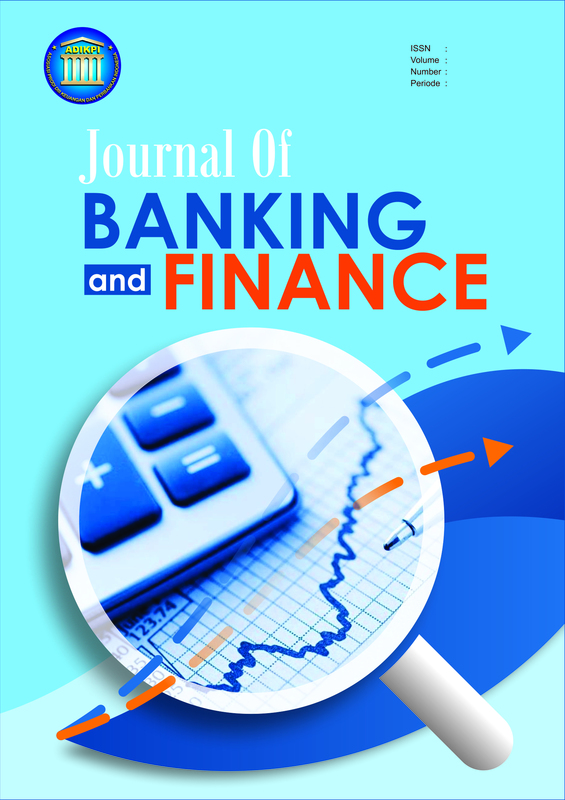 Journal of Banking and Finance publishes the result of research, conceptual studies and critical analysis in the field of economics, especially in banking and finance. 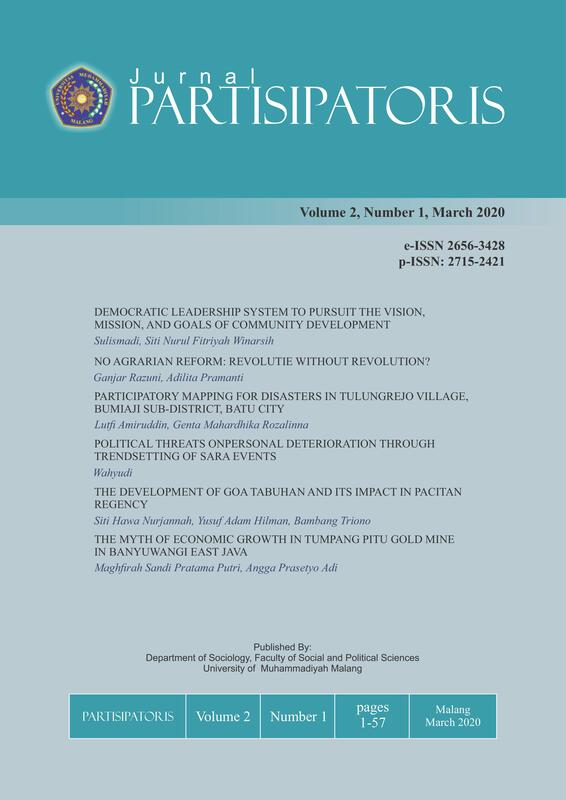 This journal is an offering of ADIKPI (Asosiasi Diploma-3 Keuangan dan Perbankan Indonesia) in the role of participation in improving and distributing knowledge. Table twice a year that is April and November. This Journal is published by Departement Agribusiness, Faculty of Agriculture and Animal Husbandry, University of Muhammadiyah Malang. 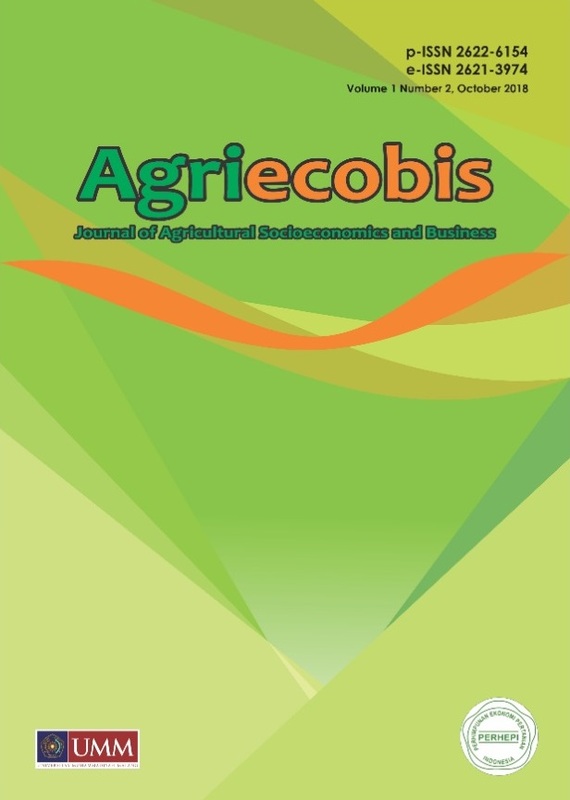 The Journal of Agriecobis focuses on 1. Agribusiness, 2. Agricultural Socioeconomics, 3. Agricultural Economics, 4. Rural Counseling and Development, 5. Rural Sociology, 6. Marketing Management, 7. Human Resource Management, and 8. Entrepreneurship. This journal is published twice a year (March and September). 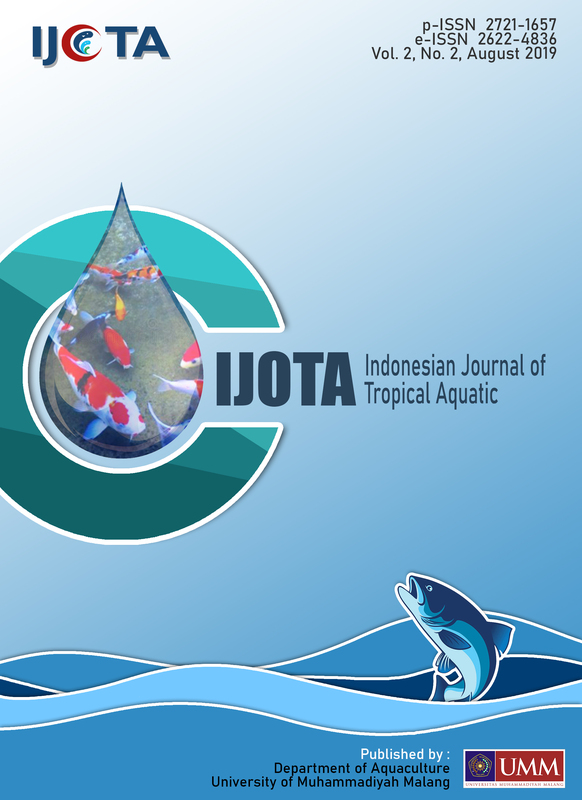 Indonesian Journal of Tropical Aquatic (IJOTA) is an open access publishes papers two times a year in February and Augst. IJOTA will publish the research results that useful for sustainability of fisheries. IJOTA is a scientific journal that discusses the results of research in science, technology and marine fisheries that has not been published. Articles should be created in a language that is easily understood by non-specialist readers in the topic of the article itself, but interested in research. This scientific article includes the results of research on fish nutrition, fish parasites and diseases, genetics and fish breeding, fisheries engineering and biotechnology and also coastal management. Journal script should be written in English. 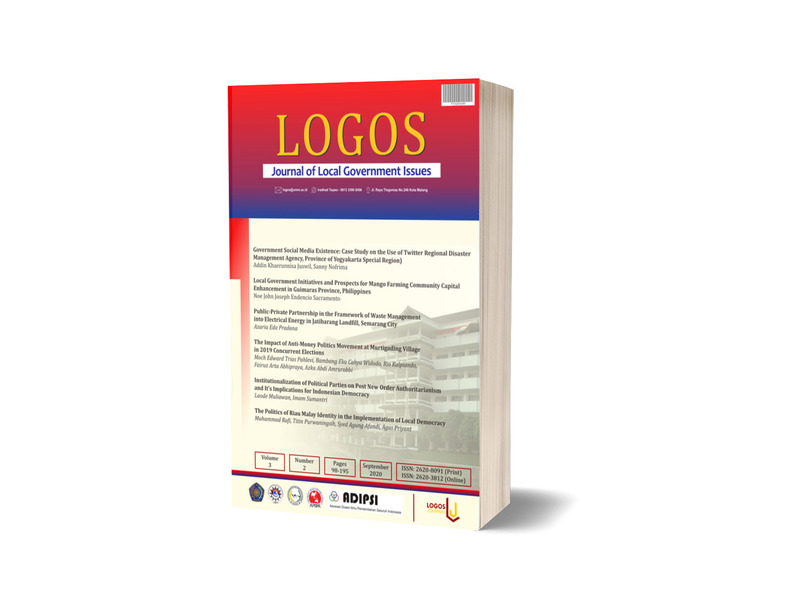 Muhammadiyah Law School Jornal (MLSJ) is a peer-reviewed journal published by Association of Muhammadiyah Law School (Asosiasi Program Studi Ilmu Hukum- APSIH PTM) se-Indonesia. MLSJ was established since 2017. MLSJ will be accepted DOAJ-(2018) ACCREDITED by RistekDIKTI (2020). Publication Frequency is published two times a year, in Mey, and December. Jurnal Inovasi Ekonomi (JIKO) adalah jurnal akademik yang mencakup semua bidang bisnis dan ekonomii. Jurnal ini berusaha untuk mengkaji inovasi keadaan terkini di bidang bisnis, ekonomi dan manajemen yang dimungkinkan oleh kemajuan informasi, komunikasi, dan teknologi. Kami juga menerima pada aplikasi informasi, komunikasi, dan teknologi dalam model bisnis, biaya dan pendapatan, etika bisnis, strategi bisnis, aplikasi inovasi dalam bisnis dan manajemen, kewirausahaan, sistem informasi, bisnis internasional & studi lintas budaya, pemasaran, studi organisasi, manajemen umum serta ekonomi mikro dan makro. 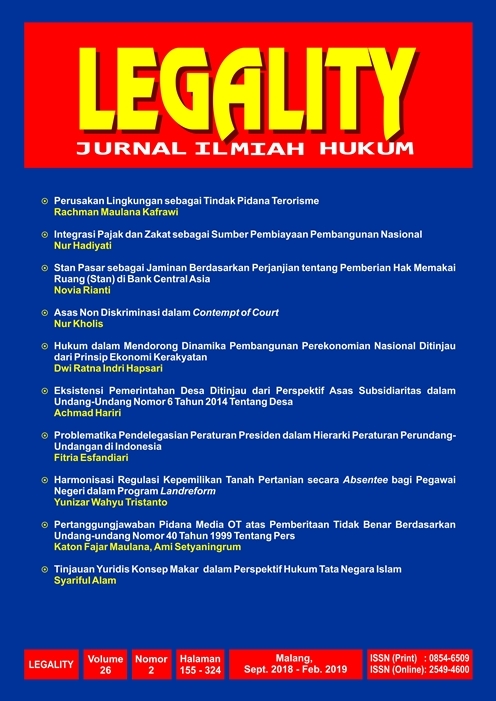 Jurnal Ilmiah Hukum Legality (JIHL)” is a peer-reviewed open access Journal to publish the manuscripts of high quality research as well as conceptual analysis that studies in any fields of Law, such as criminal law, private law, bussiness law, constitutional law, administrative law, international law, islamic law, criminal justice system, and the others field of law as a forum to develop the science of Law. 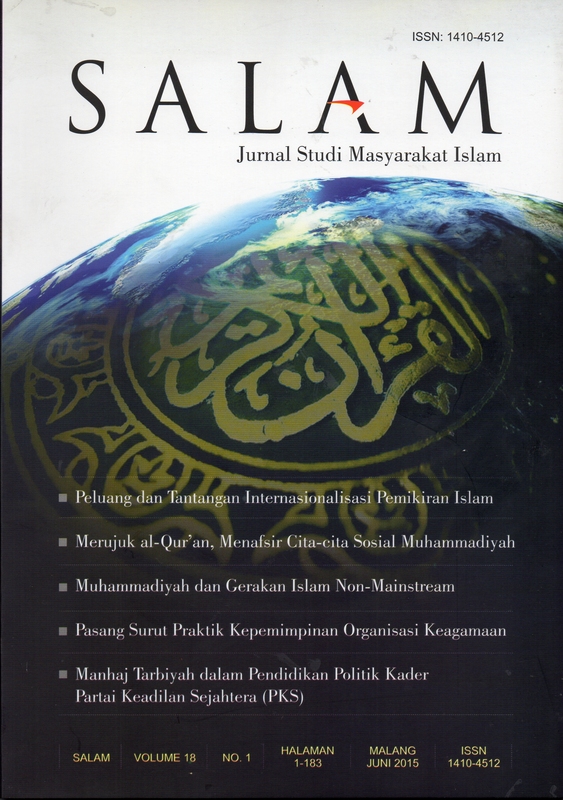 JIHL published by University of Muhammadiyah Malang twice in a year every March and September. Jurnal Ilmiah Hukum LEGALITY has been indexed by Google Scholar and Crossref. Farmasains is a scientific publication for widespread research and criticism topics in pharmacy science studies. Farmasains is published twice a year in April and November since June 2010 by Department of Pharmacy University of Muhammadiyah Malang. One volume of Farmasains is published in two year calendar. 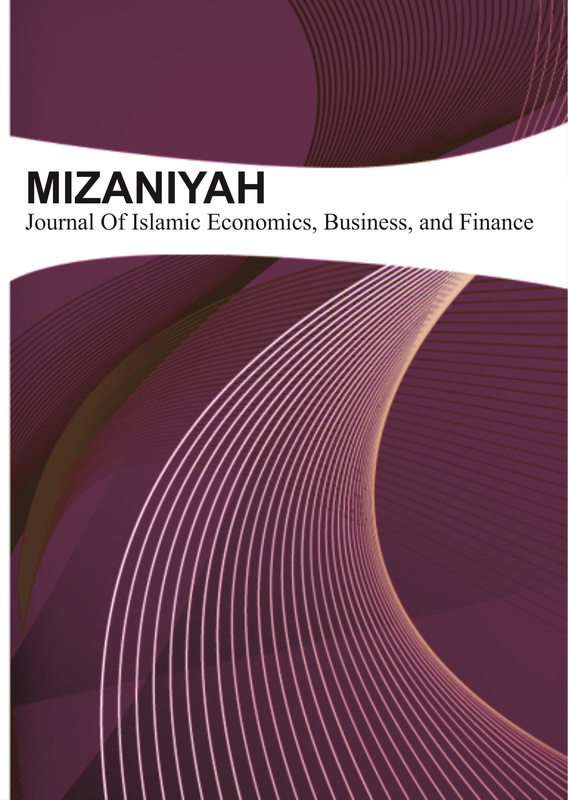 Journal Mizaniyah published by Pusat Pengkajian Keuangan Syariah (P2KS), Faculty of Economics and Business, University of Muhammadiyah Malang. This journal is used as a source of information about scientific works in the field of Islamic Economics, Business and Finance for every academician, researcher, lecturer and activist and other authors. Jurnal Kebijakan dan Pengembangan Pendidikan, diterbitkan oleh Program Studi Kebijakan dan Pengembangan Pendidikan Universitas Muhammadiyah Malang, terbit dua kali dalam volume pada bulan Januari dan Juli. Berisi tulisan ilmiah hasil penelitian dibidang kebijakan dan pengembangan pendidikan. MEDIO ISSN xxxx-xxxx (online) is published twice a year in May and November. Contains writing that is lifted from the results of research and conceptual thinking in the field of communication. Publishers receive written contributions that have never been published in other media. Posts can be directly inputted into the system of Komunikator e-journal on this page by way of registration first. Incoming scripts will be edited for uniformity of formats, terms and other ordinances. 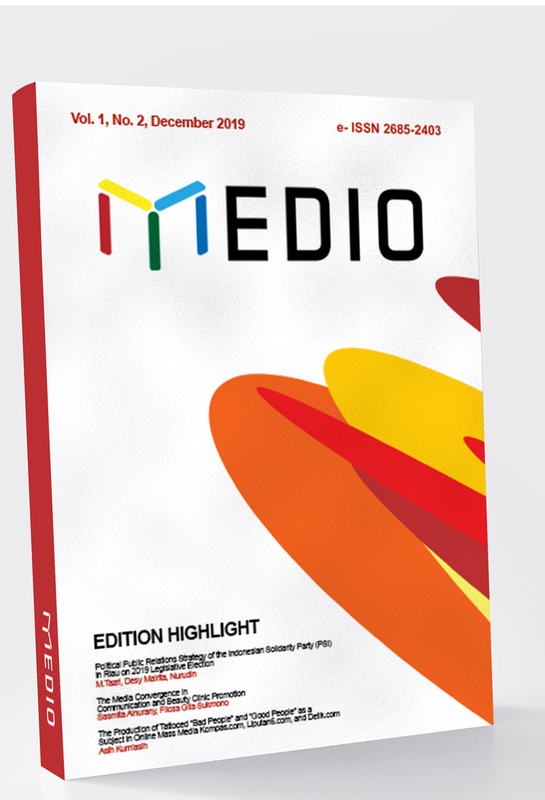 The MEDIO is published by Universitas Muhammadiyah Malang. Jurnal Sains dan Praktik Psikologi (JSSP) merupakan jurnal ilmiah yang diterbitkan oleh Psychology Forum Program Studi Magister Psikologi. Direktorat Program Pascasarjana (DPPs), Universitas Muhammadiyah Malang. JSSP terbit mulai tahun 2013, terbit tiga kali dalam setahun yaitu Januari, Mei dan September. Diterbitkan dalam bentuk cetak dan elktronik. Artikel dapat berupa laporan lengkap dan laporan singkat. 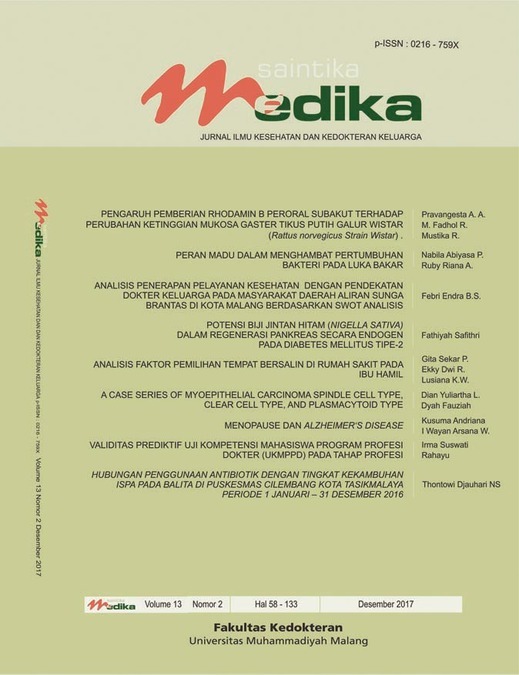 Journal of Forest Science Avicennia diterbitkan oleh Program Studi Kehutanan, Fakultas Pertanian-Peternakan, Universitas Muhammadiyah Malang dengan bekerjasama dengen PERSAKI (Persatuan Sarjana Kehutanan Indonesia). Journal of Forest Science Avicennia diterbitakan dua kali dalam setahun. Ada empat disiplin ilmu yang masuk ke dalam bahasan jurnal, Manajemen Hutan, Budidaya Hutan, Konservasi Sumber Daya Hutan, dan Teknologi Hasil Hutan. 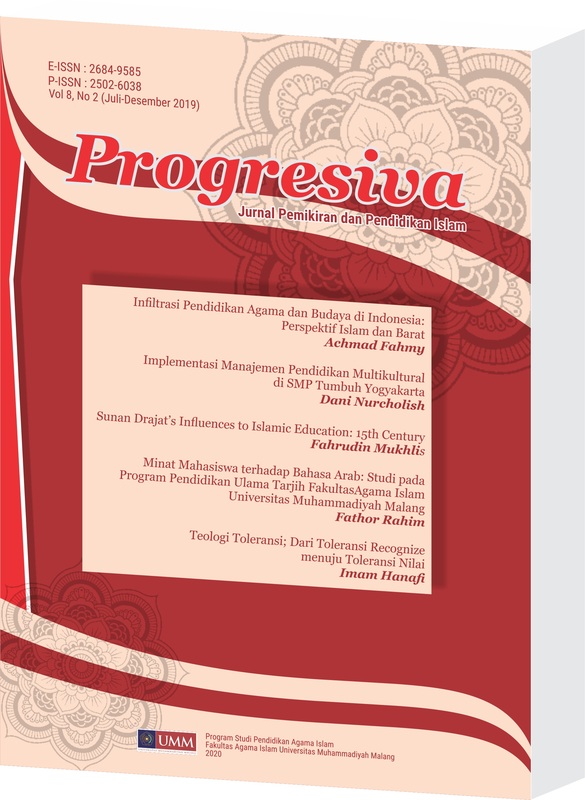 Progressiva merupakan jurnal yang diterbitkan oleh Program Studi Pendidikan Agama Islam Fakultas Agama Islam, Universitas Muhammadiyah Malang. Progressiva telah terdaftar pada ISSN (2502-6038) dengan skala penerbitan enam bulan sekali, Januari - Juni dan Juli - Desember. Jurnal ini berfungsi sebagai media para peneliti untuk menuangkan hasil pemikirannya. Progressiva mengkhsusukan diri dalam kajian Pendidikan Agama Islam serta berupaya menyajikan berbagai hasil riset ilmiah terkini dan bermutu. Journal Intermediasi published by the Department of vokation Financial and Banking, Faculty of Economics and Business, University of Muhammadiyah Malang. This journal is used as a source of information about scientific works in the field of economics for every academician, especially lecturers, students and alumni of the University of Muhammadiyah Malang and other authors. Izdihar Journal was published by Universitas Muhammadiyah Malang. It is an open access journal in Arabic Department – Faculty of Islamic Studies. This journal is available for researchers who want to improve knowledge in those particular areas and intended to spread the knowledge as the result of studies. IZDIHAR journal is a scientific research journal of Arabic teaching, linguistics, and literature. It is open for anyone who desires to develop knowledge based on qualified research in any field. Submitted papers are evaluated by anonymous referees by double-blind peer review for contribution, originality, relevance, and presentation. The Editor shall inform you of the results of the review as soon as possible, hopefully within 4 - 8 weeks. The research article submitted to this online journal will be peer-reviewed at least 2 (two) reviewers. The accepted research articles will be available online following the journal peer-reviewing process. In order to improve the quality of articles, we inform you that for each submitted article must be written in English or Arabic. There are at least two authors and ten articles references from journal and proceeding using Mendeley or EndNote as referencing software. Ulumudin is managed by Department of Islamic Family Law, Faculty of Islamic Studies, University of Muhammadiyah Malang (p-ISSN 1410-5608) This journal published two times a year (Pebruary and August) since 2007. The journal presents the results of research in the field of Islamic Law and so on. Global-Local Interactions: Journal of International Relations is a multi-disciplinary journal published twice a year by the Department of International Relations, Universitas Muhammadiyah Malang. Jurnal Partisipatoris adalah media untuk publikasi artikel ilmiah di bidang kajian sosiologi, yang bersifat terbuka bagi mahasiswa, dosen, guru, praktisi dan umum sepanjang sesuai dengan ruang lingkup jurnal Partisipatoris. Adapun ruang lingkup jurnal partisipatoris adalah prospek, peluang dan tantangan sosiologi indonesia; isu-isu mutakhir sosiologi sebagai ilmu murni dan terapan; hasil penelitian (penelitian aksi partisipatoris, penelitian tindakan kelas, Fenomenologi, Etnografi, Studi kasus), Ringkasan dan atau pengembangan skripsi / tesis / disertasi / hasil survei yang belum pernah diterbitkan di media lain. 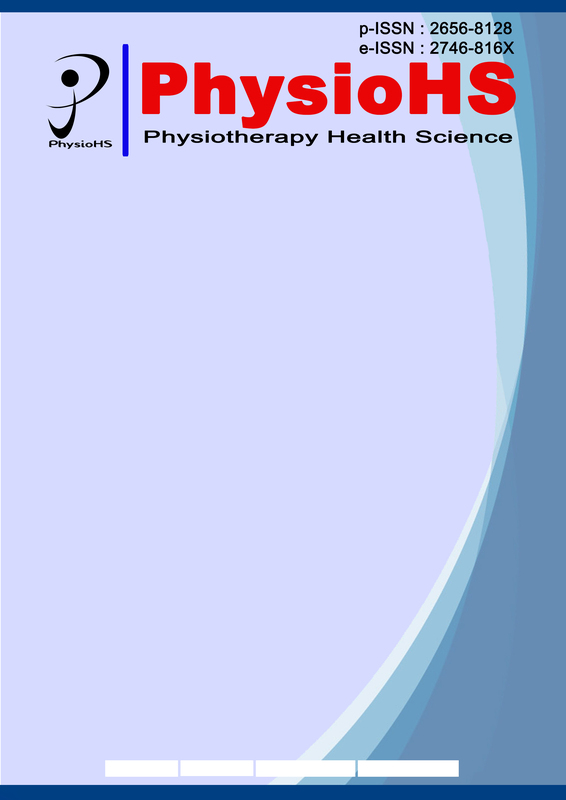 PhysioHS is a scientific publication and communication for widespread research and critism topic in physiotherapy and health science. PhysioHS was published by Departement of Physiotherapy Universitas Muhammadiyah Malang with frequency twice yearly in Juni and December. 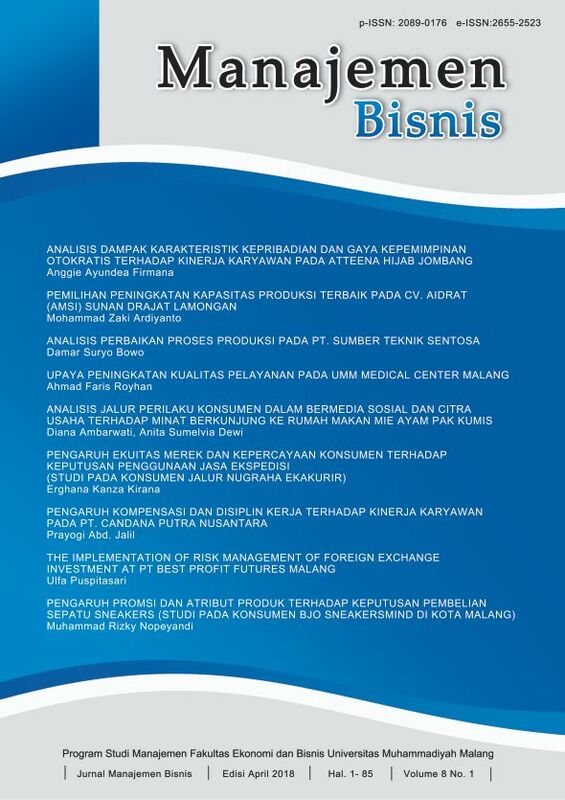 Jurnal Akademi Akuntansi (JAA) publishes research papers included in the field of accounting studies. Topics of manuscript studies can include (but are not limited to) themes about financial accounting, management accounting, accounting information systems, auditing, public sector accounting, sharia accounting, taxation, intellectual capital, and entrepreneurship. 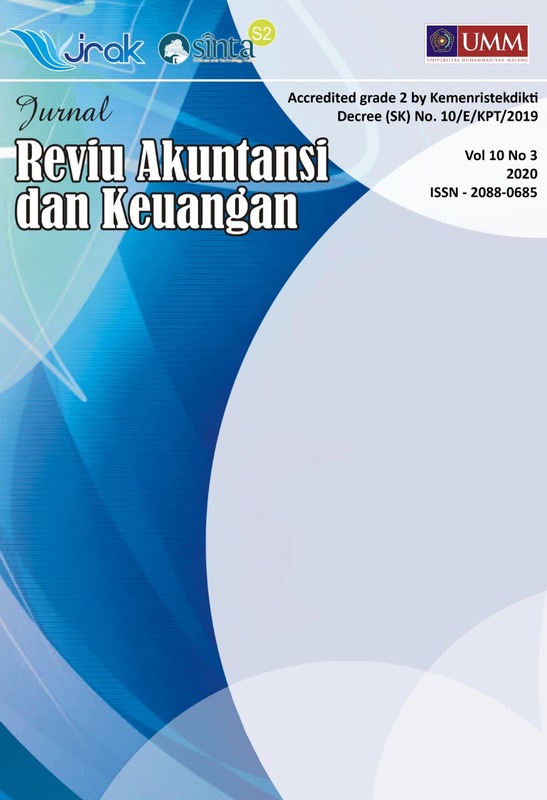 Jurnal Akademi Akuntansi (JAA) is published 2 (two) times a year, in May and November.